Ipswich memory project was an art commission I worked on between January and August 2011. St Elizabeth Hospice in East Suffolk commissioned an artist to work with patients, staff, volunteers and family members to create an art object as part of the celebration of their 21st anniversary. The project theme became researching memories, the memories of patients, staff and carers. These included memories of water such as Ipswich Docks, the Coastline, Southwold beach and memories of the land such as Corn Fields, Trees and Gardens. The other compelling memory was that of touch and in particular holding hands with family, lovers and friends. I took many photographs of hands, in particular using hands of time and experience. I wanted to get the idea of love, care and strength, without sentimentality. After working on different images, I settled on two. 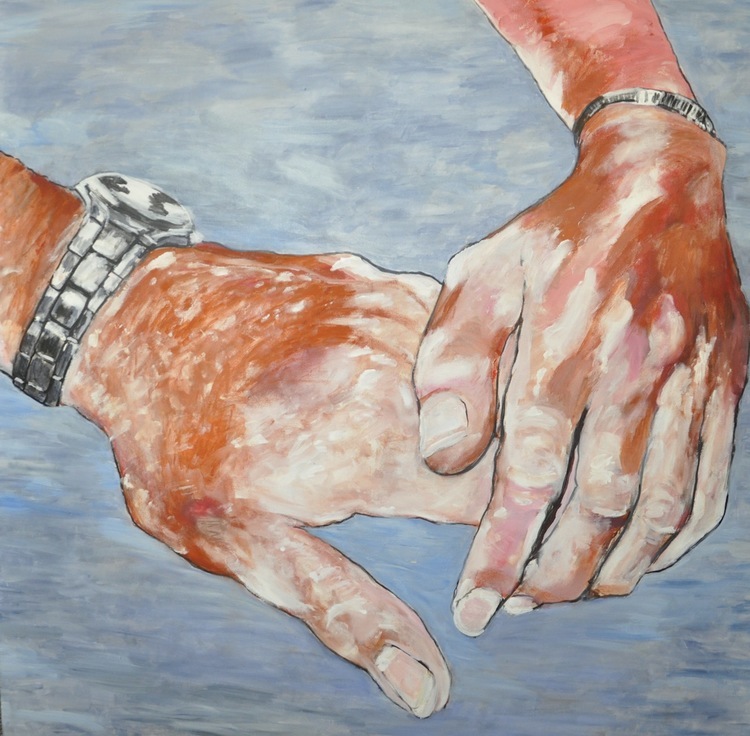 In one the hands are holding tightly together- in the second, one hand is gently consoling the other. This resulted in four large paintings using acrylic on canvas. 90 x90. I also created a sound installation, which contained the sound of a voice listing the memories that people had contributed. The piece was designed to be used as a loop on headphones, which could be placed anywhere- inside or outside the hospice – or in the community such as a Library or transmitted through speakers in an empty dark gallery space. It was designed to evoke in a darkened space the memories that described the sense of sound and sight and touch and smell.